On May 10, 1869, the transcontinental railroad was completed as the Central Pacific and Union Pacific railroads met in Promontory, Utah. 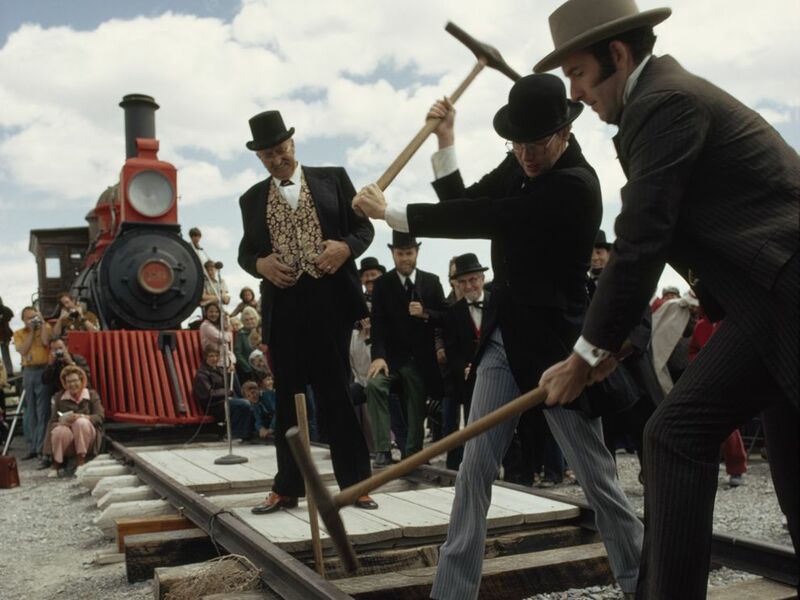 This 1975 re-enactment celebrates the driving of the "Golden Spike" in Promontory, Utah, marking the completion of the Transcontinental Railroad. On May 10, 1869, the transcontinental railroad was completed as the Central Pacific and Union Pacific railroads met in Promontory, Utah. Leland Stanford, president of the Central Pacific, drove in the ceremonial “Golden Spike,” officially connecting 2,826 kilometers (1,756 miles) of track. Development of the railroad began in 1832, although it wasn’t until 1853 that Congress approved the funds to survey and plan the course. Construction officially started in 1866. Workers, many of whom were Chinese or Irish immigrants, put in long hours under harsh conditions. The transcontinental railroad contributed to the rapid western expansion of the nation. Before the track was competed, it would take travelers months to get from the East Coast to the West Coast, either by land or sea. With the transcontinental railroad, this trip could be made in a matter of days.